I got a sneak preview of Scientific American‘s Earth 3.0 special issue on ‘Solutions for Sustainable Progress’. Mostly great stuff, with the exception of one article, that prompted me to write this rebuttal. I don’t think for a moment that we’re going to conserve our way out of the energy crisis. Internet history shows that prosperity depends on abundant bandwidth. Prosperity (gross domestic product, per capita) is proportional to energy use. We are not going to lower per capita consumptionof energy in the U.S. We are going to enable the rest of the world to be as prosperous by using not less but more energy. We need to make energy cheap, clean and therefore abundant – really abundant, for a really long time. Sounds familiar? This is the same kind of thinking endorsed in an earlier McKinsey study, and also to a lesser extent, by Al Gore in his Moon Shot Challenge speech. Makes me mad. The average citizen is already confused enough. The last thing we need is more tenors in green tech and green biz to lull us into thinking that technology will get us out of our mess. Besides, I do not see what climate change has to do with the Internet. We need to get out of this pervasive either-or thinking. Energy conservation and new energy technologies are not mutually exclusive. Instead, they are meant to work together. One without the other will not work. It’s a matter of simple maths, and of mitigating our risks, in the unlikely event that technology does not deliver on all its promises. What’s In That Fish I’m Eating? 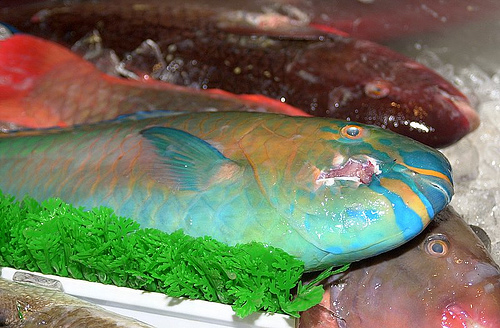 This parrot fish at the fish stand in Honolulu Chinatown looked too good, not to buy it. After yesterday’s post, I just wonder how safe is it? How much of the chemicals from the pelagic plastic we found on the beach, have made their way into the flesh of the parrot fish? Add a few dead fishes. And Prad and I had plenty of material for another depressing conversation. I told him about the work done by Algalita Marine Research Foundation, and their expeditions to the Garbage Patch in the middle of the Atlantic ocean. If I hadn’t researched this before, I may even have missed the tiny plastics. Every time I visit the island, I am struck by the casual attitude of its inhabitants towards their environment. 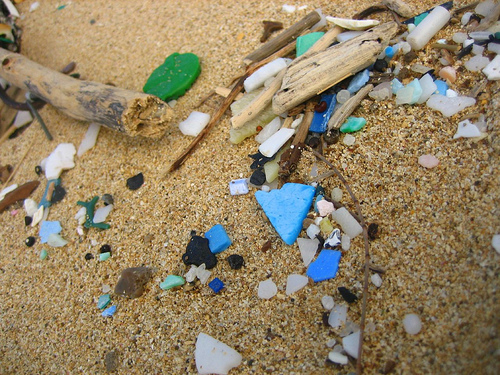 Trash not just on the beach, but also along hiking trails, roads, . . .
‘Acqua naturale o gassata?‘ The waiter asked us with a smile. Our request for tap water was met with another smile, followed by a firm ‘no’. Too thirsty to pass, we gave in and were quickly served a one litter bottle of Italian mineral water. Ten meals later, and a few more tries along the way, we have learned to no longer bother. 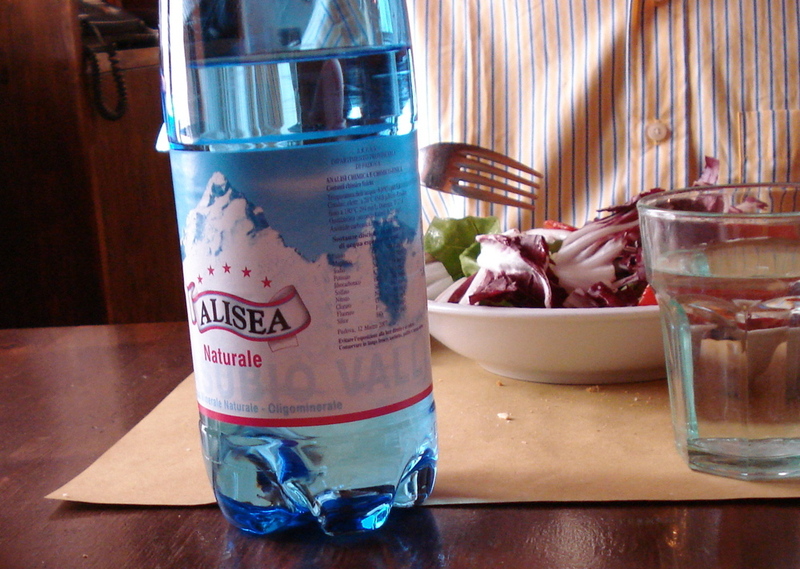 We have adopted the Italian custom of drinking bottled water at every meal. Over duck confit and sea trout, Prad and I engaged into a passionate conversation with Hong, the woman sitting next to us, at ‘Le Pied de Fouet’, one of my favorite little restaurants in the Latin Quarter. We quickly learned that Hong is involved in big carbon trading and energy deals all over the world. Hong’s friend was listening quietly, then brought up her niece, a chemist. ‘My niece says global warming is a natural thing, and there is nothing we can do about it.‘ The chemist had been convincing enough, that Hong’s friend did not feel any urgency and took a passive stance towards climate change. ‘Have you heard of “An Inconvenient Truth”‘, Hong asked. No, her friend hadn’t, but she was willing to check it out. Climate deniers and their naive followers know no frontiers. The deniers are a hard bunch to reason with. Their followers, on the other hand only need to be shown the real truth, to understand.